The American economy is in trouble, stubbornly high unemployment, sinking consumer confidence, faltering growth - all point to the real possibility of a double-dip recession. Perhaps most alarming of all is the American public's loss of faith in the political class to come up with an effective response. 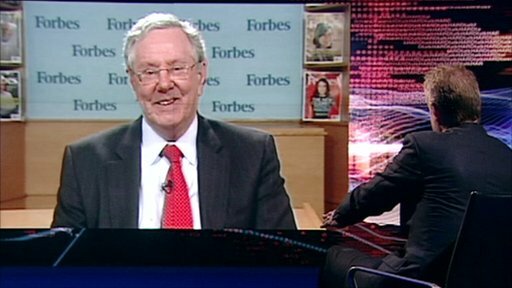 Stephen Sackur spoke to Steve Forbes, multi-millionaire publisher, conservative activist and former Republican presidential candidate, about how to boost the economy. Watch the full interview on BBC World News on Tuesday 23 August 2011 at 0330, 0830, 1530 and 2030 GMT and on the BBC News Channel on Tuesday 23 August 2011 at 0430 and on Wednesday 24 August at 0030 BST.